We are eleven days post-earthquake as of today. May 7th update: for three years prior to the earthquake, I have dealt with culturally-specific reactions of Nepali people to unexpected tragedy and loss. For any person or group that deals with this issue, please read this previous blog entry. then feel free to contact me. The problem of anger is only going to get worse, in my opinion. what do u say to a person who denies to stand from the bed..because he doesnt want to live anymore..because he lost his son,daughter,grandchildren, house everything all in a day..what do u say to him? with what words do i console him? I am feeling emotionally drained….. In the New York Times see the picture above. Yes, there is a woman there in the center, in the deepest pain a person can feel. I don’t cry easily but I did. And yet – there are eight other women right there. these are her “cousin-sisters” perhaps, or her “sangha” and they exemplify the deep collectivism of Nepali culture. She is grieving and those women are there for her. “They’re going to need grief counseling here,” is the conventional wisdom. And this was for a Nepali person. I am assuming that western counselors will come here and offer advice. I teach critical care skills to nurses and doctors here in Nepal and have done so since 2011. I teach many high-tech skills for resuscitation of people when their heart has stopped. It’s the core of what I do. But from the beginning I have been reminded by my Nepali colleagues that the best-delivered team response in an emergency does not always save the victim. (something I already knew long ago in USA). Not only that, but there are cultural manifestations of acute grief here, that must be addressed at the time of death. For that reason, I always budget time in each class session to role play the scenario of counseling the “patient party.” In each of the sixty five sessions I have led, we engage in an open-ended problem-solving discussion as to how to proceed when we did not save the life of the patient. Participants share stories. We debrief. Every Nepali nurse and doctor has needed to deal with counseling of family members in deep shock who express their grief by acting out. This is a “collectivist” society, with specific implications regarding the way the group reacts to a bad situation. 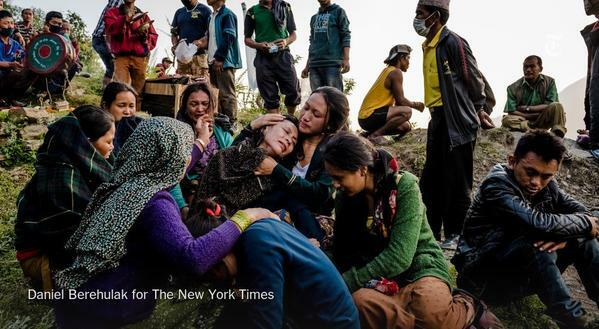 Clarification: click here to another earlier blog entry about specific manifestations of acute grief in Nepali hospitals that was a nationwide problem, before the earthquake. If you are a western mental health specialist who is thinking of coming here, be advised that you really need to study the material on Hindu and Buddhist rituals of grief and mourning before you come. One of the true strengths of Nepali society is the way that it supports individual members who are in grief. Here is an intro on mourning in Hindu culture. This one is particularly important because it describes Pashupattinath, in Kathmandu. Here is another excellent one. And another, this one by a western woman married to a Newari guy. And another that describes Buddhist rituals. In my second book, The Sacrament of the Goddess, I was going to write about how one particular character picks up the pieces of her life after a traumatic event. Then I realized, everyone in this book is picking up the pieces after a traumatic event. And I developed each character as the book unfolded, with that understanding. For these reasons, I guess you could say that I have studied this issue of acute grief in Nepal for three years. The most important thing to tell all my Nepali friends? Start by allowing yourself and your friends, to simply be human. Start by allowing yourself to weep, if that is how you feel. We will all be here for each other. This entry was posted in medical volunteer in Nepal and tagged anger in Nepal, bereavement counsleing in Nepal, Buddhist rituals of mourning, grief counseling in Nepal, Hindu rituals of mourning, jutho, Kathmandu earthquake, mental health counseling in Nepal, mental health needs in Nepal after the earthquake, mourning in Nepal, Nepal earthquake, Pashipattinath after the earthquake, PTSD in Nepal. Bookmark the permalink.